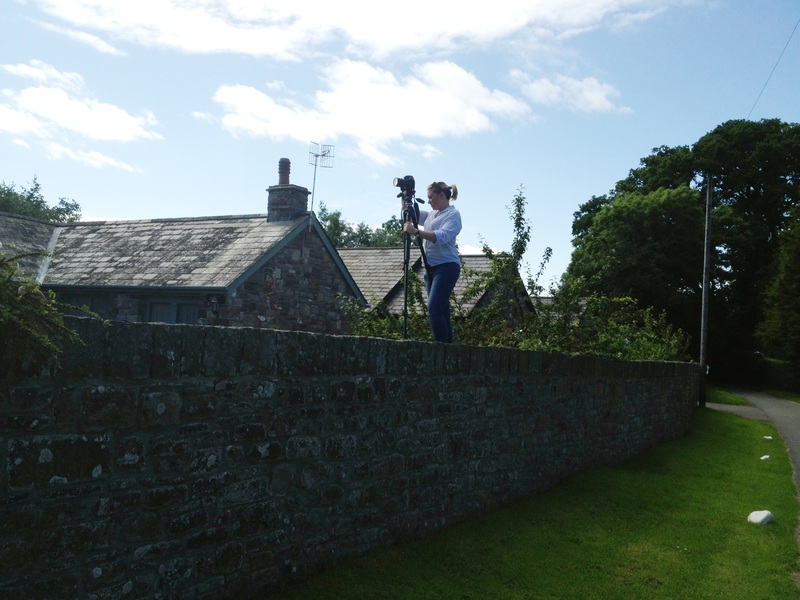 Well, fab new pictures of Hen Stabl – not easy to take – look at our photographer Lucy on top of a wall on a ladder with her tripod – Oh Dear Health and Safety!!!! And then on take a few photographs of strawberries and white wine on the terrace at Old Stonemasons and the garden and lane looked wonderful. Lucy, our photographer, taking photos of Hen Stabl. I have just been over to Hay-on-Wye to visit and take on the books another two new cottages – one contemporary and one “olde worlde” watch this space and they come with the option of a wonderful hamper from Authentically Welsh. As I drove up our drive I thought this is why I live here in the heart of the Brecon Beacons National Park – there were a pair of red kite circling over the tractor that was cutting the hay…. mice beware, kite have very sharp eyes. 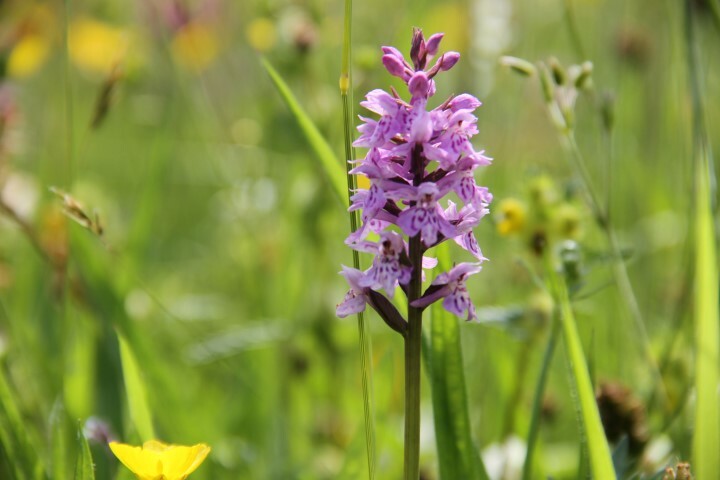 Thank goodness they are not cutting hay in our back field yet as I have found some orchids and could not bear for them to become organic hay! 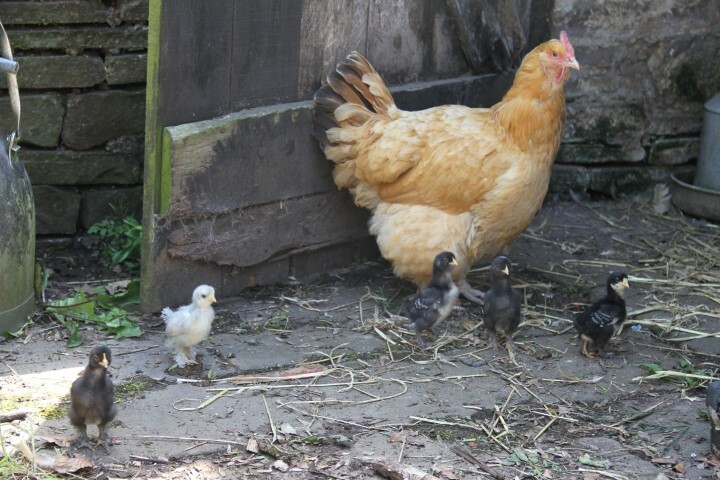 The chicks are growing fast – definitely some “Silky” in them as they all have fluffy legs and the ducks are laying well – four eggs every day…….. but what to do with all the eggs there is a limit to the amount of cakes I can make!!! This morning I could hear a great deal of whistling and bleating and dogs barking and quad bikes – the sheep being gathered and bought down off the hill – so I guess our neighbours will be shearing in the next day or two.